When your mom is no longer able to live on her own it may be time to ask for help. That help may be in the form of an assisted living community. You will have many assisted living questions that need to be answered before you find the right community. It is important to outline how an assisted living community can meet your mom’s needs. One of the first steps is to create a list of assisted living questions before you speak to a professional. These questions will not only help you understand what each community has to offer, but can also assist you in making a priority list of what is most important to your family. How many residents live in your community? How many staff members care for each resident? What type of training does your care staff complete? Are staff trained to care for residents with memory loss or Alzheimer’s? Do you have nurses on staff? What type of safety measures do you have? What is the monthly cost? What are the differences in price? Can I speak with another family member at the community? What types of activities, outings do you offer, and how often? Are there additional fees for services or activities? What additional services are available if the care or personal needs change while living here? How do you help my mom adjust to her new home? How often do you communicate with me about my mom? Do you offer hospice and end of life care? What should I know that I have not asked? The next step is to talk with friends, family and medical professionals for recommendations, and research local communities online. Print this list and have it available as you tour the assisted living communities you have chosen. If you do forget to ask a question or you need clarification, call or email your contact at the community. This will also give you an idea of their responsiveness. Choosing an assisted living community for your mom is an important decision. 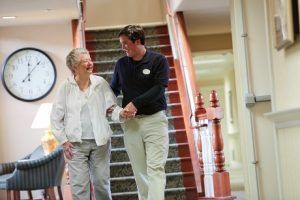 Ask questions until you feel satisfied that you understand all the options, policies, and benefits of the living in an assisted living community that meet your criteria. Visit our website to learn more about making the right decision for your Mom.